By putting SUMIF Formula in the worksheet cell and entering values in it. By using the option of before the formula bar. According to the given figure, we’re going to calculate total sales of cars for 3 years based on the model of the car and the region where the cars are sold. Select cell H6, use SUMIF formula and insert the values in the formula. Press Enter after entering the values and we’ll get the total sales of Suzuki in the North region. By clicking on H6, we can see the SUMIF formula in the formula bar. 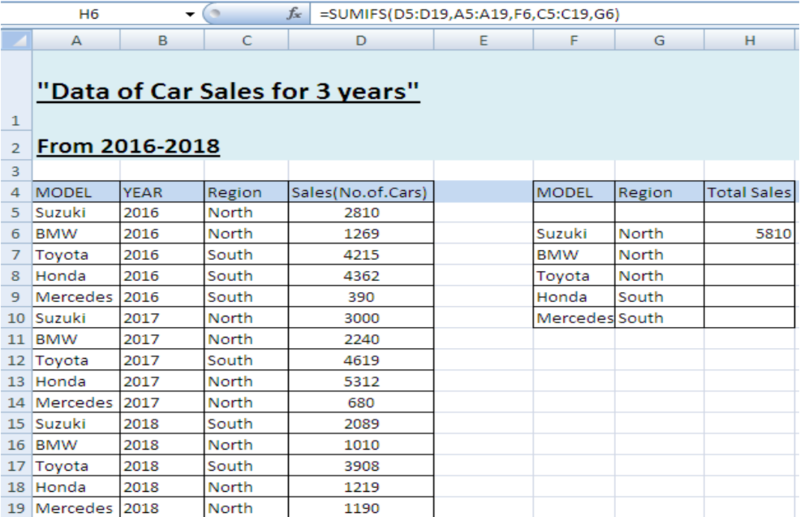 Now lock the formula by pressing F4, but remember not to lock “criteria1” and “criteria2” as they are different for every cell of total sales. Click H6 and drag it to H10 to get total sales of all the cars for the mentioned regions. Write =SUMIFS in H6, then click Fx in the toolbar before the formula bar. A small window will open in the excel worksheet carrying all the titles of the formula. 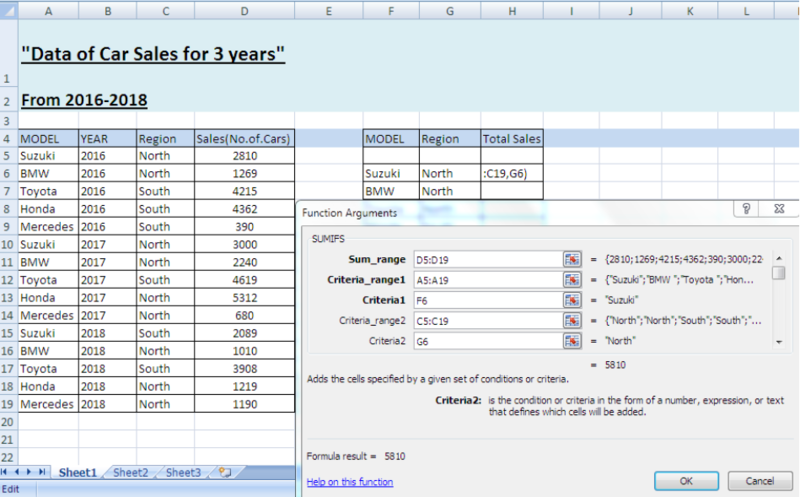 Fill the titles one by one and press OK.
We’ll get the same values obtained by using method 1. Lock the formula and drag it to H10, all the values of total sales will be calculated automatically meeting both the conditions. Otherwise, results won’t be the same. You can see this is a locked formula in case of the given example.